BBG Chairman Walter Isaacson swore in David Ensor as the new Director of the Voice of America. Isaacson highlighted Ensor’s distinguished career as a journalist and broadcaster for NPR, ABC and CNN as well as his recent work as Director for Communications and Public Diplomacy of the U.S. Embassy in Kabul, Afghanistan. Ensor took the opportunity to express his appreciation for the effectiveness of the VOA programs he observed first-hand in Afghanistan as well as the courage and commitment of VOA journalists he has encountered worldwide. Ensor will join VOA in Washington, DC on August 1. Minister of Border and Tribal Affairs Khalid greets David Ensor, outgoing Director of Communications and Public Diplomacy, U.S. Embassy, before the inauguration of the Access English program at Rahman Baba High School in Kabul, Afghanistan on Saturday, June 4, 2011. The Broadcasting Board of Governors (BBG) has selected award-winning broadcaster and communications executive David Ensor to serve as the next director of the Voice of America (VOA). VOA reaches an audience of 123 million people with unbiased news and information in 44 languages across multiple media platforms. Ensor has been Director for Communications and Public Diplomacy of the U.S. Embassy in Kabul, Afghanistan since January 2010 and will join VOA on August 1. Ensor is a winner of a National Headliner Award and an Emmy-nominated broadcast journalist whose 32-year career in television and radio news included extensive reporting on international affairs. Ensor covered the demise of Communism in Russia and Poland, armed conflicts in Bosnia, Chechnya, El Salvador, and Afghanistan, and the U.S. response to the 9/11 attacks. He was CNN’s National Security Correspondent and prior to that, an ABC News correspondent, with assignments in Washington, Moscow, Rome, and Warsaw. Ensor reported from Washington for National Public Radio covering foreign policy and defense issues. In welcoming David Ensor, the BBG thanked retiring VOA Director Danforth Austin for his outstanding leadership. The Board recognized Austin’s role in improving VOA’s ability to engage with and grow audiences across multiple media platforms, integrating broadcast, online and social media while remaining steadfast to the principles of sound journalism enshrined in the VOA charter. Appointed to the post in October 2006, Austin has been one of the longest serving VOA directors. Ensor is a member of the U.S. Council on Foreign Relations and is fluent in French. He received a B.A. with honors from the University of California, Berkeley. Ensor holds the Knight’s Cross awarded by the President of Poland. U.S. Ambassador Karl W. Eikenberry hosts a lunch for U.S. Representatives Doug Lamborn (R-CO), William Keating (D-MA), Richard Nugent (R-FL), Austin Scott (R-GA) and Rob Woodall and Afghan Parliamentarians at the U.S. Embassy on Wednesday, June 8, 2011. 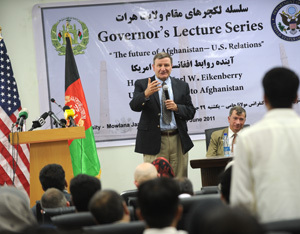 The outgoing US Ambassador to Afghanistan Karl Eikenberry gave a speech at Herat University on June 19, on the Future of U.S./Afghan Relations. Here is the link to the lengthy official speech. I would like to add, to my prepared remarks, a few additional words spoken from my heart as I, together with my wife, soon complete my tenure as ambassador. I have altogether served in your country three times and have lived here in Afghanistan for over five years starting in 2002. I believe in this mission and the need for us to prevail against terrorism. I also believe in the goodness of the Afghan people. Having travelled continuously throughout your country – all 34 provinces where I have reached out to Afghan brothers and sisters from all walks of life – I know of where I speak through firsthand experience. At the same time, I believe in the goodness of my own people – the American people. And – as we prepare to return home to my family after my most recent two years here – I must tell you that I find occasional comments from some of your leaders hurtful and inappropriate. When Americans, who are serving in your country at great cost – in terms of lives and treasure – hear themselves compared with occupiers, told that they are only here to advance their own interest, and likened to the brutal enemies of the Afghan people … they are filled with confusion and grow weary of our effort here. Mothers and fathers of fallen soldiers, spouses of soldiers who have lost arms and legs, children of those who lost their lives in your country – they ask themselves about the meaning of their loved one’s sacrifice. When I hear some of your leaders call us occupiers, I cannot look at these mourning parents, spouses, and children in the eye and give them a comforting reply. We came here in 2001 to defeat international terrorism and help lift the dark veil of over 20 years of conflict from the Afghan people. Together with you, we have accomplished so much. Of course, over the course of our time here, our learning curve has been steep. That is because Afghanistan’s political, social, and economic situation is complex, we do not speak your language and are far from home. But – in spite of our mistakes – we are a good people whose aim is to help improve our mutual security by strengthening your government, army and police, and economy. And we know that there have been many accomplishments. We have built schools and clinics; trained and equipped your army, police, and NDS and fought and sacrificed with them battling the enemy of your state; we have constructed roads and power stations; trained midwives, engineers, and journalists; offered scholarships to my country; helped organize and advise your counter-narcotics police, judicial security units, and elite Major Crimes Task Force; improved your Customs Service; helped facilitate the Afghan-Pakistan Transit Trade Agreement; renovated the Herat Citadel and many historical sites in Afghanistan; installed a world class Air Traffic Control radar at Kabul International Airport; invested hundreds of millions of dollars in bettering your agriculture system; helped renovate the Kabul museum; supported the revival of music, sports, and culture in your country; constructed roads –even while being attacked by insurgents. I could go on, but will stop here. Yet, when we hear ourselves being called occupiers and worse, our pride is offended and we begin to lose our inspiration to carry on. Let me be clear – America has never sought to occupy any nation in the world. Nor do we seek to do so here. In fact, we serve here as friends. At the point your leaders believe that we are doing more harm than good, when we reach a point that we feel our soldiers and civilians are being asked to sacrifice without a just cause, and our generous aid programs dismissed as totally ineffective and the source of all corruption . . . especially at a time our economy is suffering and our needs are not being met, the American people will ask for our forces to come home. I would ask, as the outgoing Ambassador, that your leaders please bear this in mind when they speak of my nation, my armed forces, and my people, as well as those others who also are making contributions to and sacrifices for your country. The “America has never sought to occupy any nation in the world,” is good to hear but not quite right, is it? Nonetheless, a more interesting speech than the prepared speech, don’t you think? The addendum need to be said is all and probably not surprising that he said it at the end of his tour. The only thing missing, and something that Ambassador Ekenberry was too diplomatic to add but we in this blog are not too polite to point out … Afghanistan’s “leaders” often do not survive very well the departure of their “protecting” powers. I hope Mr. Karzai has a Plan B when he does not have the United States to kick around anymore or blame for all that’s wrong in his country. We can get out of Afghanistan, yes we can. And what if the bad guys find a new cave over there and attack us again? Well, there is always SEAL Team 6. But that’s not really what’s keeping us awake at night, is it? I think the larger question for us is — do we spend our limited funds on Afghanistan to ensure that the bad guys (100 of them) cannot harm us again in the future? Or do we spend that money here, now and ensure that our country has a future? Just an example on what that bleak future looks like. At Whitney Elementary School in Las Vegas—an estimated 85 percent of the students are either “homeless or on the brink.” And that’s just one of the many challenges facing Nevada’s Clark County Public Schools, the nation’s fifth-largest school district, where according to Scholastic, 46 percent of students qualify for free or reduced-price meals and the number of homeless children continues to soar. CBS recently did a piece on this here. Whitney Elementary School, USA. How is it that we are re/building schools and whatever and pouring billions of dollars over there, and right here in Nevada, in the 36th state in the union this is happening? And Nevada is far from alone. I think we need to face this painful fact. We need reconstruction to begin here at home. How about PRT-Nevada or PRT Michigan? And Mr. Karzai should proceed with his Plan B, if he has one.